Fusion systems based on the reaction of deuterium and tritium (the heavy isotopes of hydrogen) contain large quantities of lithium, the basic need for which is to produce the tritium fuel. The worst-case environment-impacting event would result from a lithium-fueled fire following a breach of containment. Lithium oxidizes readily in the presence of water or air (O2). Thus the design of the lithium system, an element of the power chamber system, will include numerous safety features. Typifying these features is double containment of all elements containing lithium, i.e., the power chambers, primary heat exchangers, pumps, piping, and the underground vault that encloses these components. 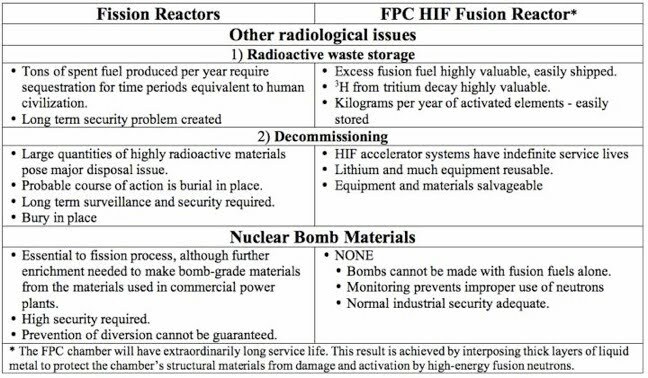 See the chart below for the worst case accident comparison between fission and fusion systems. Tritium could escape to the atmosphere if containment is breached. Such tritium escape is the main radiological concern for fusion power, and its release is the main subject of a “worst case” accident. However, release of even the total inventory of tritium in a fusion power plant (about 1 kg) would not reach the radiation level that requires evacuation (UKAEA Fusion Association study). A further safety advantage of FPC’s system is that its inventory of activated structural materials is much less than in other fusion power systems (EFDA-RP-RE-5.0 study). This is the direct result of, and the motivation for, providing a neutronically thick layer of liquid lithium (or lithium-lead mixture) inside the reaction chamber, between the point of the fusion reactions and the structural materials of the chamber. Fusion in the FPC system will produce extraordinarily small amounts of radioactivity, in consequence of basic design features conceived more than 30 years ago. For the same reasons, FPC’s chambers will have long service lives. As a result, FPC anticipates that the system will meet environmental standards readily when, and if, a system is decommissioned. From routine operations, the amount of high-level waste produced in a year will be measured in kilograms, not tons. This small amount of high-level material can readily be accommodated in approved facilities that already exist, or sequestered on site. See the chart below for the comparison of waste and decommissioning issues. 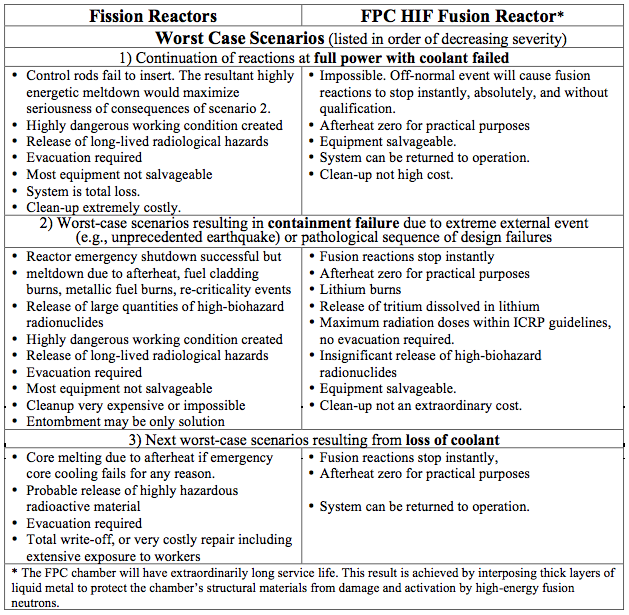 Comparison of major life-cycle safety issues between Fission and FPC-HIF Fusion power systems. If lithium does burn, it produces a lithium oxide or hydroxide ash that is caustic but is not an environmental poison. Lithium compounds are used in medicines, and as batteries throughout the world and with few exceptions lithium has proven to be a benign substance.